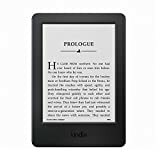 Amazon.com Price: (as of 2019-04-23 20:51:57 GMT) Product prices and availability are accurate as of the date/time indicated and are subject to change. Any price and availability information displayed on Amazon.com at the time of purchase will apply to the purchase of this product. 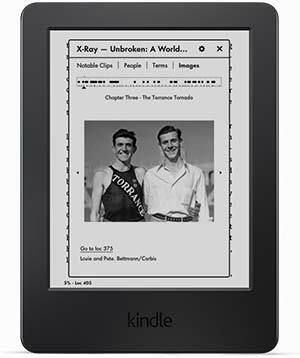 Kindle is our most affordable e-reader—now with a touchscreen display, exclusive Kindle features, twice the storage, and more. Kindle is purpose-built for reading. Indulge your love of reading without interruptions like email alerts and push notifications. The weeks-long battery life allows you to read for weeks on a single charge. Kindle uses actual ink particles and proprietary, hand-built fonts to create crisp text similar to what you see in a physical book. 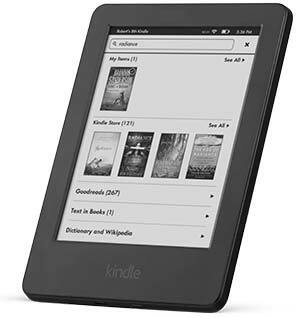 Kindle is lighter than most paperback books, making it easy and comfortable to hold in one hand for extended periods of time. Every time your eyes switch from a bright screen to a dimmer, ambient room, your eyes have to adjust, which may result in fatigue. 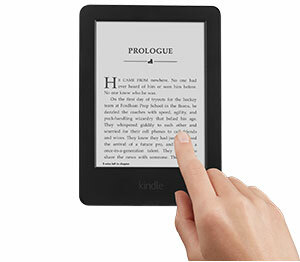 With Kindle, the page is the same brightness as everything else in the room, so there’s no adjustment needed. Choose from eight text sizes to prevent tired eyes and keep you reading longer. With Page Flip, you can skim page-by-page, scan by chapter, or skip to the end for a sneak peek without losing your place. Add margin notes that you can edit, delete, or even export from your device to your computer. Share highlighted sections and meaningful quotes on Facebook, Twitter, and Goodreads, and see passages frequently highlighted by other Kindle readers. It’s even easier to find what you are looking for by combining and previewing results from your Library, Goodreads, and the Kindle Store on the same page. Family Library links your Amazon account to that of your spouse or partner. For the first time, you and your family can access and easily share not only your own Kindle books, but also books from the Amazon account of a spouse or partner. Word Wise, available on many popular English language titles, makes it easier to enjoy and quickly understand more challenging books. Short and simple definitions automatically appear above difficult words, so you can keep reading with fewer interruptions. Tap on a word to bring up a simple card with definitions, synonyms, and more. You can adjust the number of hints you see with a simple slider. X-Ray’s new timeline view lets you easily flip through notable passages to remind yourself of what’s happened in the book, or navigate easily through images. X-Ray lets you explore the “Bones of the Book.” See all the passages across a book that mention relevant ideas, fictional characters, historical figures, places, or topics of interest. With About the Book, see information about the book as you start to read, including its place in a series and author information, plus mark it as “Currently Reading” on Goodreads. Shop Amazon’s expansive selection, choose a title, and begin reading in seconds. Download books in under 60 seconds—no computer required. Connect easily to your home Wi-Fi network or Wi-Fi hotspots on the road. Enjoy free Wi-Fi access at AT&T hotspots across the U.S. With our fast, free wireless delivery, borrow Kindle books from your public library and start reading on your Kindle.